SCVHistory.com | Film-Arts | Princess Cruises, 'Love Boat' Cast Honored on Hollywood Walk of Fame, 5-10-2018. 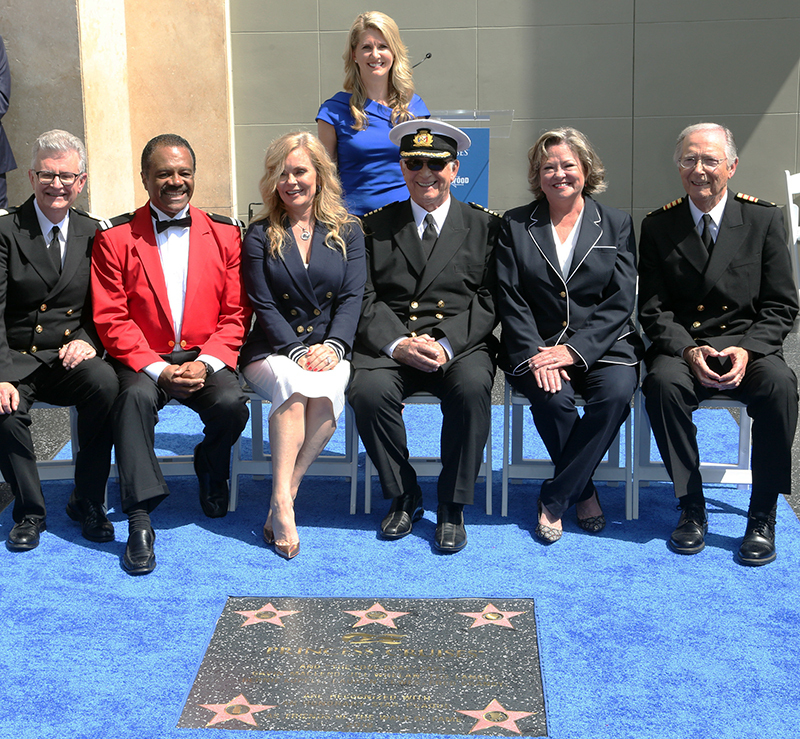 Hollywood, May 10, 2018 — Santa Clarita-based Princess Cruises and the original cast of the "The Love Boat" were presented a Hollywood Walk of Fame honorary star plaque today in recognition of their contributions to the history of television and support for the preservation of the Walk of Fame. Gavin MacLeod (Captain Stubing), Jill Whelan (Vicki), Ted Lange (Isaac), Bernie Kopell (Doc), Lauren Tewes (Julie) and Fred Grandy (Gopher) were joined by Leron Gubler, CEO of the Hollywood Chamber of Commerce, Donelle Dadigan, co-chair of the Hollywood Historic Trust, the superintendent of the world-famous walk and Jan Swartz, President of Princess Cruises. The honorary star plaque is located on Hollywood Boulevard in front of the main entrance to the Dolby Theater. "The Love Boat" premiered just over 40 years ago (May 1977), set aboard a cruise ship, featuring stories of romance, hijinks and adventure on the high seas that involved characters portrayed by Hollywood's biggest stars of the day. After the pilot show, "The Love Boat" show went on to enjoy phenomenal success, continuing for 10 seasons until 1987 as one of the highest-rated, prime-time television shows in the country. Princess Cruises soon became a household name as the primary setting and co-star of the popular series, and continues to be known as the "Love Boat" cruise line today. Pacific Princess and Island Princess were the two original ships but as the show grew in popularity "The Love Boat" was filmed aboard many Princess ships at exotic destinations around the globe. "Today marks another extraordinary day in the history of Princess Cruises. 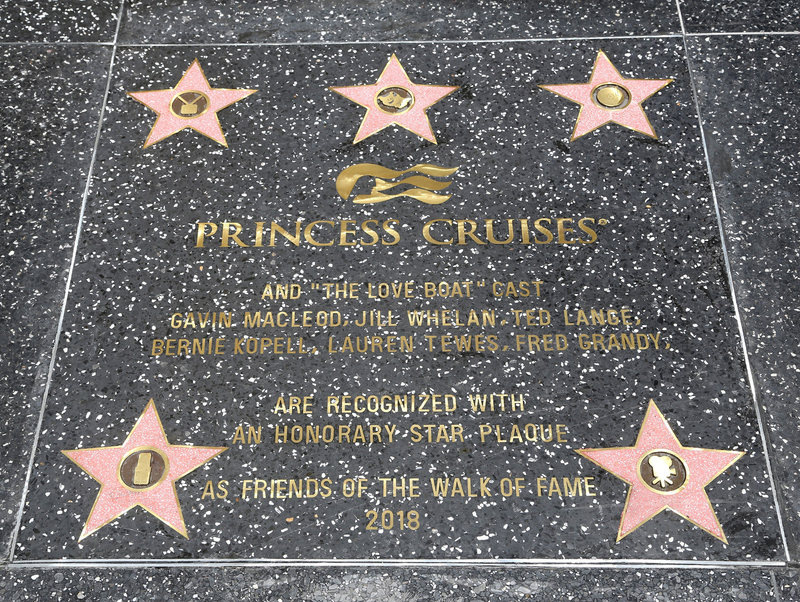 We are honored to be recognized, along with the original cast of the 'Love Boat,' as Friends of the Walk of Fame in support of the preservation of this iconic attraction that draws nearly 10 million visitors each year," remarked Jan Swartz, Princess Cruises president. "The 'Love Boat' opened the hearts and minds of millions of television viewers to the adventures of cruise travel by way of the exotic destination our ships visited on the show. Today, our guests continue to create lasting memories and explore the world on our modern, fleet of 17 premium cruise ships." Princess Cruises becomes only the third brand to be recognized as a Friend of the Walk of Fame, joining L'Oréal Paris and Absolut Vodka. Princess Cruises continues its multi-year, "Come Back New Promise" — a $450 million-dollar product innovation and cruise ship renovation campaign that will continue to enhance the line's onboard guest experience. These enhancements result in more moments of awe, lifetime memories and meaningful stories for guests to share from their cruise vacation. The product innovations include partnerships with award-winning Chef Curtis Stone; engaging entertainment inspired shows with Broadway-legend Stephen Schwartz; immersive activities for the whole family from Discovery and Animal Planet that include exclusive shore excursion to onboard activities; the ultimate sleep at sea with the award-winning Princess Luxury Bed and much more. Three new Royal-class ships are currently on order with the next new ship, Sky Princess, under construction scheduled for delivery in October 2019. The company is part of Carnival Corporation & plc. For more than 97 years, the Hollywood Chamber of Commerce has provided leadership, business development resources, networking, and government affairs programs and services to keep the Hollywood business and residential communities safe, relevant and economically vital. Donelle Dadigan of the Hollywood Museum, is the Chair of the Hollywood Chamber of Commerce Board of Directors 2018-19, and Leron Gubler is the President and CEO of the Hollywood Chamber of Commerce. For more information please visit www.hollywoodchamber.net.